vi. Officers and employees of the Supreme Court. The statements of Confederation, CHQ and NFPE, CHQ will be published shortly after collecting full details. AT MUMBAI TODAY AT 4.15 AM. WE CONVEY OUR HEART FELT CONDOLENCES ON BEHALF OF THE COMRADES OF THE CONFEDERATION OF CENTRAL GOVERNMENT EMPLOYEES AND WORKERS. WE APPEAL TO OUR COMRADES WHO ARE STATIONED AT MUMBAI TO TAKE PART IN THE FUNERAL PROCESSION WHICH IS TO COMMENCE FROM THE AIRF OFFICE AT MUMBAI AS A MARK OF RESPECT AND AFFECTION TO THE DEPARTED COMRADE. FOR AND ON BEHALF OF THE NATIONAL SECRETARIAT OF THE CONFEDERATION OF CENTRAL GOVERNMENT EMPLOYEES AND WORKERS. It is hereby notified that the women’s committee meeting of Confederation of Central Government Employees & Workers will be held at Nagpur on 04.04.2014 along with the National convention of central Government Employees and National Secretariat of Confederation. All women committee members are requested to attend National Convention and National Secretariat meeting on 04.04.2014 at Nagpur without fail. 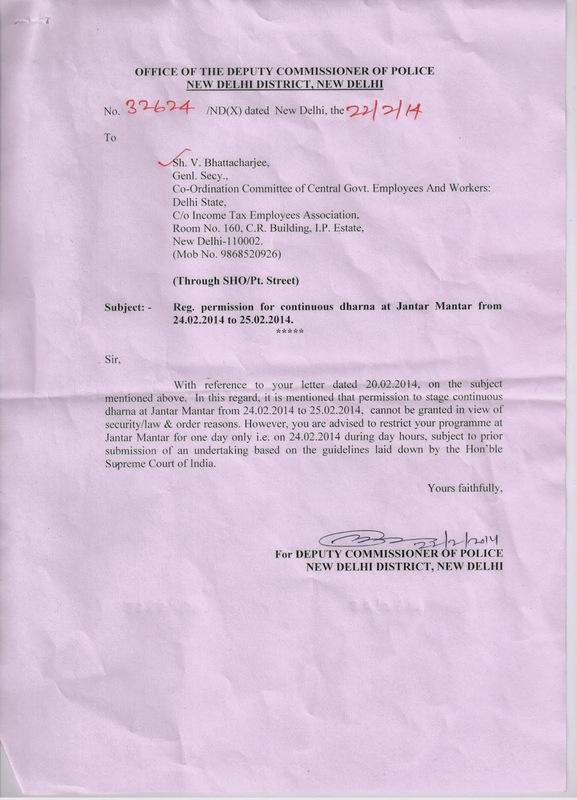 Women’s Committee Confederation of C. G.
POLICE REFUSE PERMISSION TO CONDUCT DHARNA ON THE SECOND DAY. As per the decision of the National Secretariat of the Confederation of Central Government Employees & Workers a mass dharna was conducted at Jantar Mantar (Parliament Street) New Delhi, to protest against the negative attitude of the UPA Govt. and Finance Minister Shri P. Chidambaram towards the 15 point charter of demands of the Central Government Employees, including DA merger, Interim Relief, inclusion of GDS under 7th CPC, Date of effect 01.01.2014 etc. Even in the Budget (Vote on account) presented by the Finance Minister in Parliament there is no mention about any of the Central Govt. Employees demands. Even though the dharna was scheduled for two days; it was concluded in the first day evening itself, as the Delhi Police denied permission for the Second day. (See Police Order below)Com. KKN Kutty, National President of the Confederation inaugurated the dharna. He declared that Confederation has decided to go fo an indefinite strike, immediately after election, if the Govt. is not ready to concede our demands. He congratulated all the Central Govt. Employees who made the Feb 12th & 13th two days strike a thundering success. National Convention of the Confederation scheduled to be held at Nagpur on 4th April 2014, will decide the future course of action and also strike programme. Com. S.K. Vyas, Advisor, Confederation, Com. M S Raja , Working Chairman, Com. Narasimhan, Vice President,Com. M. Krishnan. Secretary General,Com. Giri Raj Singh, Vice President, Com. Vrigu Bhattacharjee, Financial Secretary and General Secretary C-O-C Delhi, Com. R N Parashar, Asstt. Secretary, Com. R. Seethalaxmi G/S P-IV, Com. P. Suresh G/S R-IV, Com. A.K. Kanojia (ITEF), Coms. Harender Singh, Tirath Prakash (R-IV), K.P. Singh (R-III), Ami Chand , Rajesh Kumar Gautam (R-III), Balwinder Singh (P-III), N. Subramaian (P-III),Com. K. Ragavendran, Ex, S.G., NFPE, Com. K.V. Sridharan, Ex. GS-P-3 , Com. D.K. Rahate, Ex. President, NFPE ,Com. Gita Bhattacharjee (Convernor , Women Sub Committee) and so many other Comrades from C-O-C Delhi participated in the day long dharna. Please refer to Confederation CHQ Circular dated 18.02.2014 wherein the decision of the National Secretariat meeting held on 18.02.2014 was communicated (see website). As a part of the campaign against the neo-liberal policies being pursued by both Congress and BJP and also for preparing of an indefinite strike on our 15 point Charter of demands, immediately after the election an intensive campaign programme has been planned. Our stand regarding the neo liberal policies and also future course of action are well explained in the resolution adopted in the National Secretariat. It is decided that in the National Convention to be held at Nagpur on 4th April 2014, the following number of delegates from each organisation and C-OC should participate without fail. Delegates for National Convention may be decided urgently and their up & down tickets are to be booked now itself. The national Convention will commence at 10.30 AM on 4th April and continue up to 4 PM. Immediately after the 12th & 13th February two days National strike of Central Government employees, the National Secretariat of the Confederation has met at Delhi on 18.02.2014. As only short notice was given many National Secretariat members could not attend that meeting. It is decided to hold the meeting of the National Secretariat at Nagpur on 4th April 2014 at 4 PM. All National Secretariat members are requested to attend the National Secretariat meeting and Convention WITHOUT FAIL. A meeting of the National Secretariat of the Confederation of Central Government Employees & Workers will be held at Nagpur (Maharashtra) on 4th April 2014 (Friday) at 4 PM, immediately after the conclusion of the National Convention. The following shall be the agenda of the meeting All National Secretariat members are requested to attend the meeting in time. 1. Detailed review of the Feb 12th & 13th two days strike participation. 2. Implementation of the decision taken in the National Secretariat meeting held on 18.02.2014. 3. National Convention to be held on 4th April 2014 at Nagpur – Review. IN THE TERMS OF REFERENCE OF SEVENTH PAY COMMISSION. MAHADEVAIAH SIGNED THE DEATH WARRANT OF 2.76 LAKHS GRAMIN DAK SEVAKS. HE WANTS TO KILL THE CHILD EVEN BEFORE ITS BIRTH. Recognised union (Mahadevaiah) accepted the stand of the Government and Postal Board that GDS are NOT Government employees (Civil servants) and hence they cannot be included in the Seventh Pay Commission which is for Government Employees. Government and Postal Board cleverly managed Mahadevaiah to sign a written agreement accepting their stand, so that he cannot go back from the agreement again. All organizations in the staff side, JCM National Council including Railways, Defence, Confederation, NFPE & FNPO has taken a firm stand that we will not accept separate committee (Whether separate Judge or Bureaucrat) for GDS this time and GDS should be included in Seventh CPC itself. Recognised GDS union leader (Mahadevaiah) became an Agent of the government and signed Agreement accepting the Government’s stand. Mahadevaiah admitted that GDS are not civil servants and hence a separate committee is enough. NFPE & FNPO and also the GDS unions of NFPE (AIPEU-GDS-NFPE) & FNPO (NUGDS) strongly condemn and protest against the foul play and treachery of Mahadevaiah and Postal Board. Hold Protest Demonstrations in front of all offices on 26.02.2014 demanding cancellation of the agreement and inclusion of GDS in the 7th Pay Commission itself. All of you are aware that all the Unions and Federation of the Staff Side, JCM National Council including Railways, Defence, Confederation, NFPE & FNPO have taken an unanimous stand that Gramin Dak Sevaks of the Department of Posts should be included in the 7th Pay Commission and we will not accept any separate Committee (Whether Judge or Bureaucrat) for GDS. This is the first time the entire JCM (Staff Side) including Railways and Defence is taking such a firm stand. Accordingly JCM (Staff Side) has submitted a letter to the Government (DOP&T) to include GDS in the terms of reference of 7th CPC. The matter is now pending before the Government for a decision. NFPE & FNPO and the GDS unions of NFPE (AIPEU-GDS-NFPE) and FNPO (NUGDS) has conducted two days nationwide strike demanding inclusion of GDS in the terms of reference of 7th CPC. Both NFPE & FNPO has already declared that they will jointly go for an indefinite strike, if the demand for inclusion of GDS under the 7th CPC is not accepted by the Government. But to our shock and surprise, the recognised GDS Union leading by Mahadevaiah has signed an agreement with the Postal Board agreeing for the appointment of a separate committee for GDS. No Unions/Federations including Mahadevaiah’s union have demanded a separate committee (either Judge Committee or Bureaucratic Committee) in their charter of demands submitted to the Government and the Department of Posts. The 7th Pay Commission is appointed for Central Government Employees (Civil Servants). Separate Committee (even if it is a separate Judge) means GDS are not civil servants and they are only Extra-Departmental. Why should Mahadevaiah accept such a stand of the Department and Government? Earlier also one separate committee of Retired Judge (Justice Talwar Committee) was appointed for GDS. But even now GDS are Extra-Departmental and not treated as Civil Servants. Inclusion in 7th CPC means Government accepting our demand that GDS are Government employees (Civil Servants) and their service conditions and wage structure will be examined and recommended by 7th CPC alongwith other Central Government Employees. Thus a century long discrimination towards GDS shall come to an end. Even Justice Talwar Committee has recommended that in future, no separate committe (either Judge or Bureaucratic) should be appointed for the GDS and they should be included in Pay Commissions itself. By accepting a separate Committee, Mahadevaiah has spoiled the entire future of GDS. By signing an agreement with the Postal Board, the Recognised GDS Union (Mahadevaiah) has signed the Death Warrant of the 2.76 lakhs Gramin Dak Sevaks. He has played a drama with the Postal Board and Government and cheated GDS and defeated the very purpose of the united stand taken by all the JCM Staff side organizations. Postal Board has cleverly managed Mahadevaiah to sign an agreement itself. Normally after discussions with the unions, minutes are signed and copy given to unions. In this case, the Postal Board was very particular to get an agreement signed by the Recognised Union (Mahadevaiah) so that he cannot go back from the agreement in future. Ironically, for all other demands raised by Mahadevaiah in his Charter of Demands only separate minutes is given by the Department. Departmental officers and DOP&T are very inteligent and shrewd and they obtained what they want!!! When Recognised union signed an agreement, tomorrow the Government will say to the staff side that as the recognised union has already agreed for a separate committee, we are not including GDS in the 7th CPC. Thus, the Recognised Union of the GDS (Mahadevaiah) has become an agent of the Government. As already stated by us, Postal Board and the Government have succeded in their game of “Divide and Rule”. That is why Mahadevaiah has not joined the joint strike of two days conducted by NFPE, FNPO and the GDS union of NFPE (AIPEU-GDS-NFPE) and FNPO (NUGDS) on 12th & 13th February 2014. In the coming days the hidden agenda behind the separate strike held by Mahadevaiah and the agreement will come out with more clear. The Department and the Government always used to told NFPE & FNPO that by appointing a separate committee (either Judge or Bureaucratic) GDs will be much benefited. They have compelled NFPE & FNPO to accept separate Committee. We rejected the offer of the Government & the Department as we are well aware, from our past experience, the danger behind it and also the hidden agenda of the Government & the Department. Finally after the two days strike the Secretary, Department of Posts has given us a letter informing that our demand for inclusion of GDS in Seventh Pay Commission is referred to Government (DOP&T) for a decision. The Government understood that when the entire JCM staff side has taken a firm united stand, it will be very difficult for them to reject our demand. They wanted to pre-empt the united stand of the staff side. That is why the indefinite strike drama was played (eventhough participation was very less) and finally an agreement was signed behind the curtain and declaring that this is a greatest achievement (!) and this is a first step towards the liberation of GDS (!!! ), as if there was no separate Judge Committee (Talwar Committee) appointed by Government earlier. It proved beyond doubt that both the Recognised Union (Mahadeviah) and the Government want to keep the GDS always outside the Pay Commission and always as “extra-departmental employees”. “DEATH WARRANT OF 2.76 GRAMIN DAK SEVAKS”. We further call upon the entire employees to conduct protest demonstration all over India on 26.02.2014 in front of all important offices against the stand taken by the Postal Board and demanding to remit the GDS issues the purview of the Seventh Pay Commission. CONFEDERATION DECIDES TO GO FOR NATIONWIDE INDEFINITE STRIKE IN THE MONTH OF JUNE, 2014. On 24th and 25th February, 2014. To protest against the total neglect and negative attitude of Central Government in the Budget towards Central Government employees. NATIONAL CONVENTION OF CENTRAL GOVERNMENT EMPLOYEES ON 4th APRIL, 2014 AT NAGPUR. NATIONWIDE CAMPAIGN DURING THE PERIOD FROM MARCH TO MAY, 2014. The National Secretariat met today. It reviewed the strike participation on the basis of the reports received from the States and the affiliates. The meeting noted with appreciation the efforts undertaken by the affiliates and the State leaders in making the stake a grand success. On the basis of the deliberations, the meeting adopted the enclosed resolution and took the following decisions. 1. To organise 48 hour Dharna on 24th and 25th Feb. 2014 at Delhi against the attitude of the finance Minister in not conceding the demand for Interim relief and merger of DA etc. , while presenting the Vote on Account. The National leaders along with the active workers of Delhi will participate in the programme. 2. To organise a National Convention at Nagpur on 4th April, 2014 from 11 AM to 5 PM to mobilise the employees for the task for accomplishment detailed in the enclosed resolution, especially in the coming general election. 3. The State Committees will organise such conventions in all State Capitals for the same purpose. 4. Campaign meetings will be organised in front of all Central Government offices, where the District level and State level leaders will detail the decisions taken by the National Secretariat. 5. The Confederation National Secretariat will meet in May 2014 and decide upon the indefinite strike action in pursuance of the 15 point charter of demands to be organised in June, 2014. 6. The Tamilnadu State Committee will be requested to explore the possibilities of organising campaign against Shri P. Chidambaram, Finance Minister in the Constituency from where he would seek election to the Lok Sabha. 7. The State Committees will make arrangements for translating the resolution in vernacular and circulate amongst the mass of the employees. The National Secretariat of the Confederation places on record its appreciation and gratitude over the massive and magnificent participation of the largest number of our members in the 48 hour strike on 12thand 13th Feb. 2014. It was a great manifestation of the confidence, the members had reposed in the organization and their determination to win the demands through struggles. The reports, the Confederation CHQ received both from the affiliates and the State Committees indicate the massive participation of the employees in the strike action throughout the county. In some of the affiliates, the participation had been cent percent. This must embolden the Confederation to pursue the issue with determination and organize further action programmes to ensure that the demands are got settled. The Secretariat has noted that the Government had pretended to ignore the massive action of the employees. There had been no response from them so far. In the wake of the strike action, it announced the composition of the 7th CPC disregarding the united demand raised by the Staff side of the JCM National Council for the inclusion of a labour representative. The Government also chose not to convene the meeting the staff side to discuss the draft terms of reference submitted,. It did not make any announcement on the question of merger of DA, Interim Relief, inclusion of GDS within the ambit of the Commission and rejected the demand for making the recommendation of the Commission effective from 1.1.2014. On every issue, which is included in the 15 point Charter of demands, the Govt. continued with its nugatory attitude. In the last session of the Parliament, they ensured that the PFRDA bill becomes an Act despite the strongest objection and resistance of the employees by eliciting and receiving the support and patronage of the dominant opposition party, the BJP. Even on comparatively smaller issues like compassionate appointments, no positive response emerged. The period witnessed increased outsourcing of governmental functions. Almost a third of the workforce is presently casual and contract workers with abysmally poor wages taking advantage of the acute unemployment situation in the country. There had been no settlement of any issue raised by the Staff Side in the National Council JCM. In fact no meeting of the council was convened and no issue discussed or settled during this period. The plight of the three lakh Gramin Dak Sewaks of the Postal Department is highly deplorable. They constitute almost half of the Postal workforce. But for them, the functioning of the Postal system will come to a grinding halt. Their service conditions are presently worse off than even a causal/daily rated worker. Despite the Supreme Court’s decisions that they are holders of Civil Posts and consequently are entitled to the benefits and privileges of a civil servant, there had been no improvement in their service conditions worth mentioning. In spite of repeated presentation of their case both inside and outside the Parliament by people from all walks of life irrespective of party affiliation, the Government had been silent to the pleading for bringing them within the ambit of the Pay Commissions. Confederation is duty bound and determined to change the situation and to bring them within the purview of the 7th CPC. During its five year tenure, the UPA II was in power, it intensified the neo-liberal reforms, phased out all welfare measures introduced to benefit the poor by the previous Governments; accentuated the unemployment situation by various job killing devices; divested the PSUs; allowed unbridled entry of Foreign capital to subjugate the Indian people; ruined the indigenous industry, destroyed the livelihood of the farmers and agricultural labourers, allowed the prices of all essential food items to soar, privatised education and health care services, ensured that each of its decision was to favour the rich, granted huge tax concessions to the corporate, indulged in large scale corruption, squandered away the national wealth, siphoned off the poor man’s earning into the hands of a few rich in the country, sided with the entrepreneurs in all labour disputes, took each and every political decision to sub-serve the interest of the imperialist powers, especially the USA. The pursuance of the neo liberal policies at the behest of the advanced capitalist countries drove the majority of Indian population to be below the poverty levels. In the comity of nations, our country became the poorest and the last ranking in all fields. Our youth were driven to be beggars at the doors of transnational corporations and developed countries. Those who were responsible in driving our country men to unprecedented deprivation has to now seek mandate, for their tenure is to end shortly. No different is the approach of the major opposition party, BJP. There is nothing to chose from these two political dispensations. They were hand in glove together to demolish the sovereignty of the country; pauperisation of the people and supported every legislation to intensify the neo liberal exploitation of the common people. They supported to the hilt the corporate houses. But for the support extended by the BJP, the PFRDA would never have been made into a law. The Act now provides for the extension of the new contributory pension scheme to those who were recruited prior to 1.1.2004 and the existing pensioners. Despite the refusal of the Government to accept their suggestion to guarantee minimum pension, the BJP unashamedly supported the Bill, for they were the proponents of the neo liberal economic policies. They supported this Government to increase the FDI and FII in all sectors of economy and announced that they would intensify the reform process if elected to power. The conglomeration of Corporate in the country has now appointed the leader of that party to be the next CEO to run the country. They have no use for the discredited UPA howsoever subservient it could be. They know in a democratic system demagogy can play a vital role. They are certain that BJP and its allies if elected to power will be much more pliant and compliant. It is in this background that the workers must assess the political situation. In the forthcoming electoral battle, every worker must discharge their salutary responsibility. Since the present state of affairs is the product of the neo liberal policies and since both the UPA and the NDA are the proponents of those policies, he/she must have clear vision and exercise the franchise effectively to ensure that a pro worker, pro people combination of parties is in governance. He/she must discharge that responsibility for his/her own sake and for the sake of this great nation. The Secretariat came to the inescapable conclusion that the settlement of the demands in the charter will only be possible through intensification of the struggles. It recognised the need for larger unity. It will strive for bringing about such a united platform for joint action. The inevitability of an indefinite strike action has to be emphasised. The Confederation and its affiliates must prepare its members for such an eventual and unavoidable action, if the proposed 7th CPC is to really revise the wages. It is needed to ensure the withdrawal of the pernicious contributory pension scheme. It only will ensure that there are no casual or contract system of employment in Government service. The Government employees must be bestowed with democratic rights and above all must enjoy the facility for collective bargaining and right to strike. The Gramin Dak Sewak system is a colonial legacy and no civilised country must endure such brutal exploitation. All is possible through united and sustained action. The Confederation has proved beyond any iota of doubt that it has built up an organisation capable of carrying out such an action. Such action must be planned to take place after the electoral battle is over. Every active worker of the Confederation must fan out and reach out the rank and file of the workers. Since the task is stupendous, the endeavour and effort must also be equally persisting. The meeting of the National Secretariat of the Confederation has decided to call upon all its affiliates, the State Committees, District Committees and units to work in consonance with the understanding depicted in this resolution; mobilise the rank and file for the eventual indefinite strike action in June, 2014 and strive to bring about a revolutionary change in the governance of our polity.